Yesterday I finished reading the Lux Beginnings book, which contains the first two novels from the series, and oh my gosh I loved it. The first book in the series, Obsidian, is about a girl names Katy Black who moves from Florida to West Virginia with her mom, and moves into a house next to a boy named Daemon. Then all sorts of crazy goes down. Spoiler. He’s an alien. The second book, Onyx, continues to follow Katy and Daemon’s story. There’s not really anything I didn’t enjoy about this book. I liked the writing, and despite all the aliens, the characters seemed real. In most YA novels where boy meets girl, the girl can be a pushover and written to seem all weak-kneed as soon as she sees the boy. Granted that happens in real life, but I just found Katy to be much more real about it and the way she acts doesn’t seem very far-fetched. Some people think this book is pretty similar to the Twilight Series, probably because its about a girl meeting a supernatural boy, but really that’s where the similarities end. 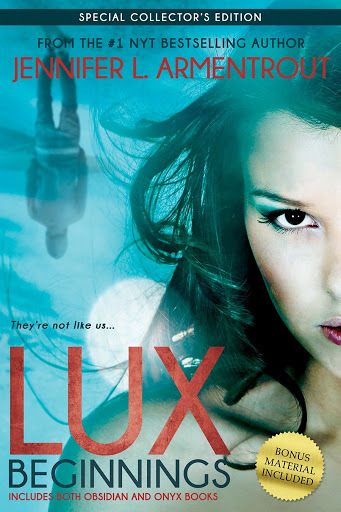 Lux has much more action, and the storyline follows more than the two main characters romance. But if you did like the Twilight books, or The Mortal Instruments, or anything like that, then definitely read this series. Today I started reading Lux Consequences, which contains books three and four of the series Opal and Origin. Make sure to follow my Goodreads to hear my thoughts as I read! My links are below.